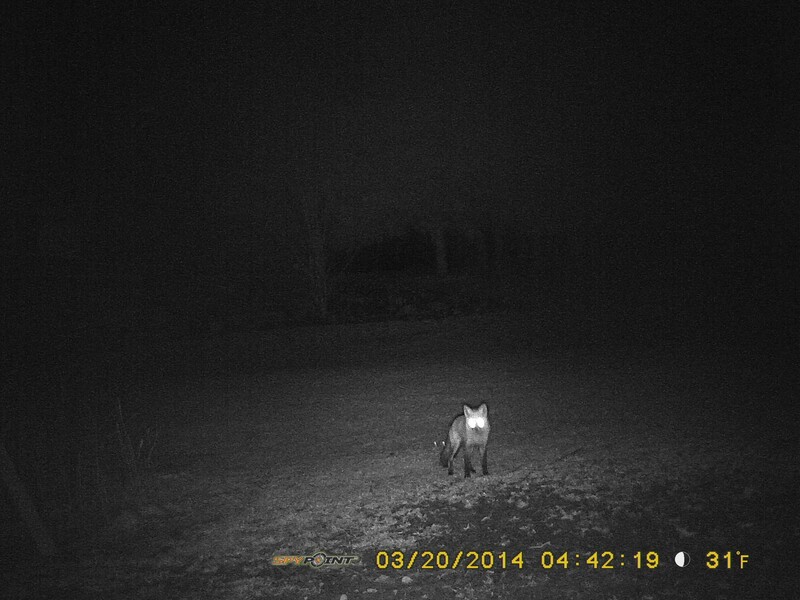 We had a fox looking the backyard over the other night. We see them occasionally but I think coyotes are more common these days. I hope to catch a bobcat one of these nights, Mrs J has seen them nearby but they are very secretive. 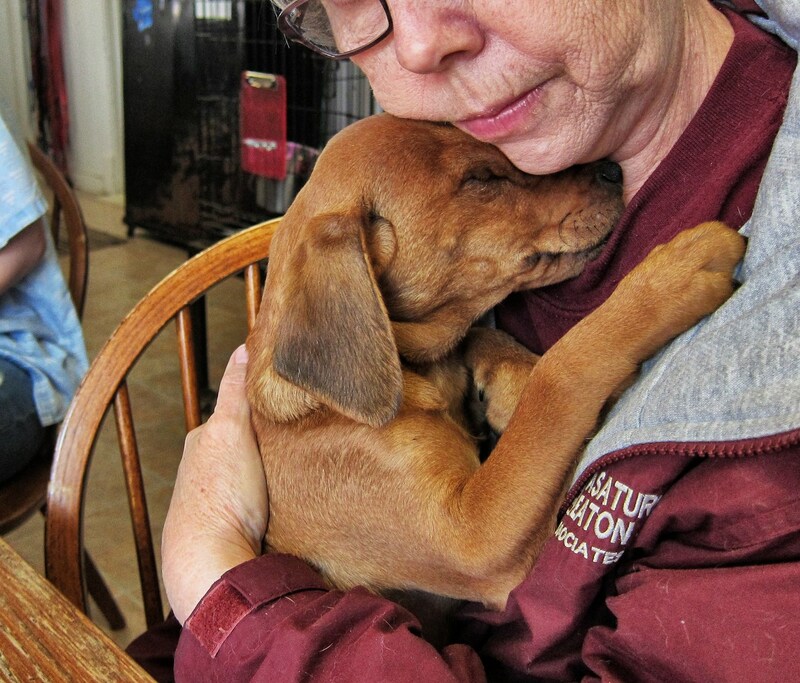 Mrs J says they have a number of kittens that are ready for adoption, and several puppies have been taken in, as well: This is a ten week old MinPin x hound dog, one of seven in a litter. 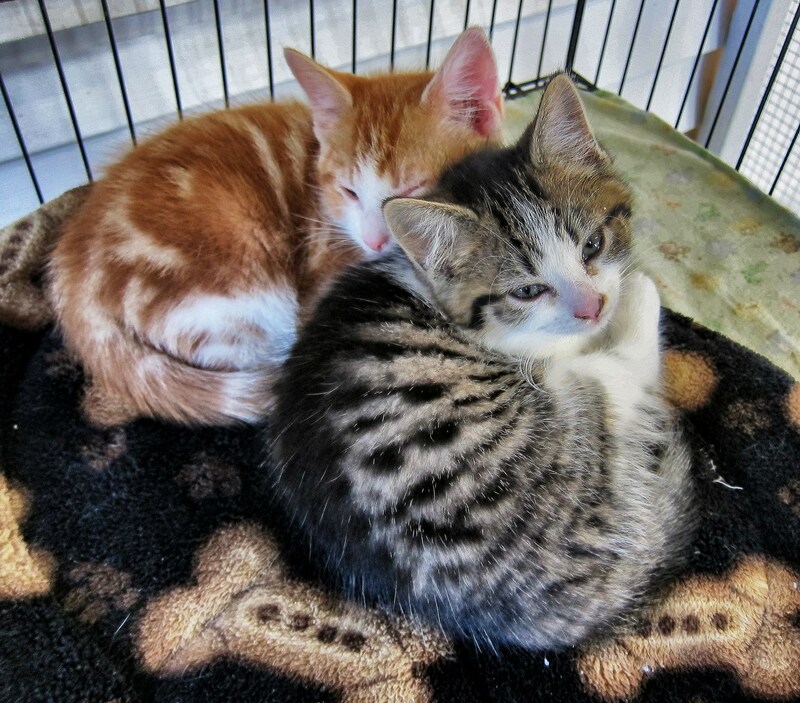 Four of the tan color like this one, and three black and tans. Mrs J says they are really calm and laid back for puppies, not as squirmy as most. 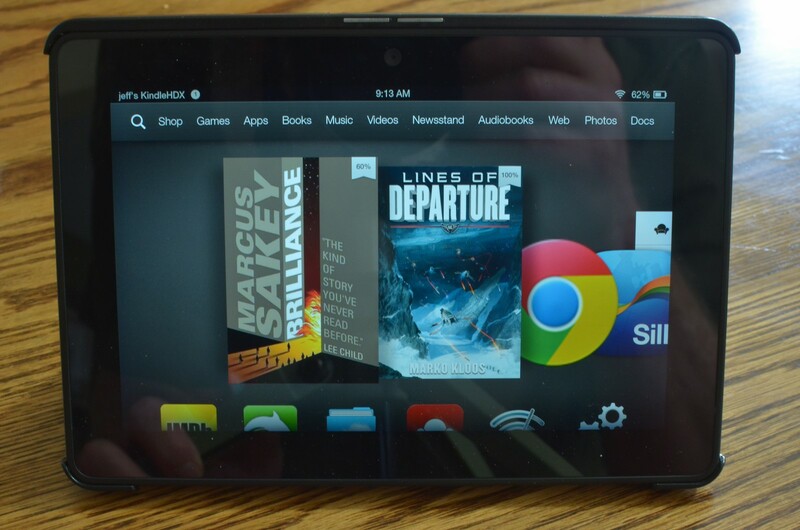 I bought another tablet the other day, a Kindle 7″ HDX. It is the best e-reader I’ve used, that’s pretty much what it was built to do along with viewing videos. It’s a bother that it won’t let me access the Google play store but you can sideload many of the apps. I’ve loaded the Chrome browser, and one called Dolphin that is very good. The included browser, Silk, is pretty good but lacks a way to import bookmarks from other browsers. For almost everything but reading e-books I still prefer my Nexus tablets. Steak! 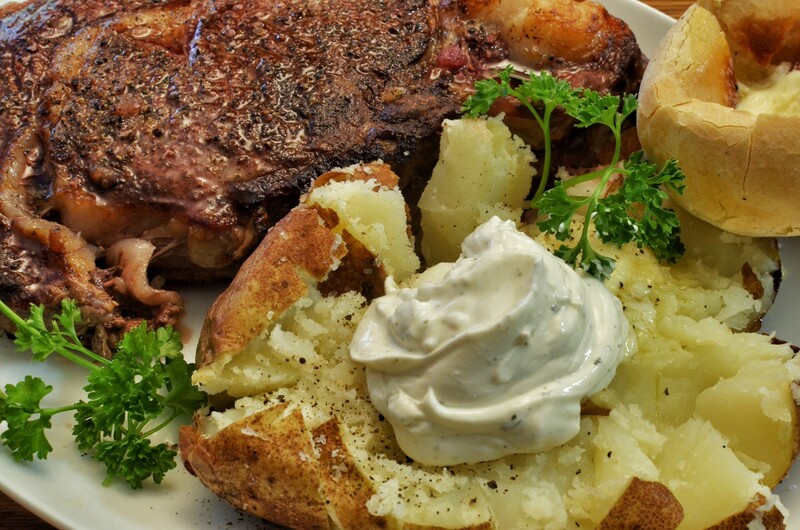 And a baked potato with the store brand French onion dip. We almost never buy straight sour cream. This particular dip has a very mild flavor that subs very well for sour cream almost everywhere. 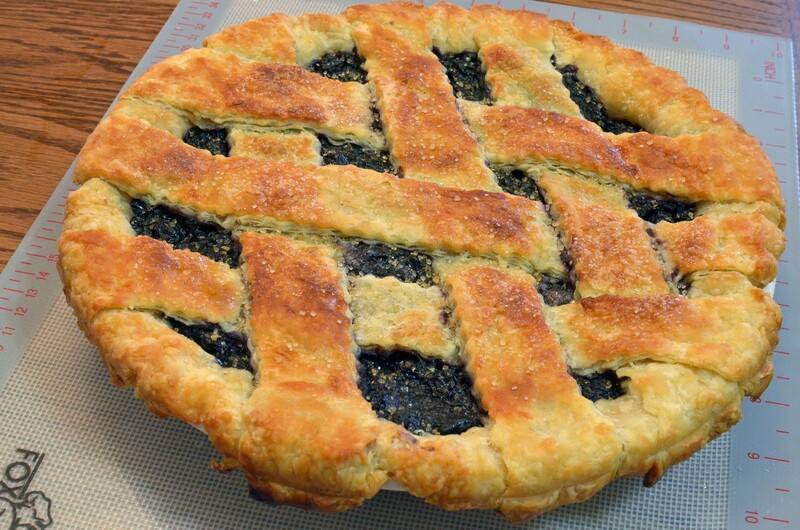 Here’s a blueberry pie that I nagged Mrs J into making for Pi day (3/4/14). We had a little trouble with the over/unders but there was no impact on the taste. 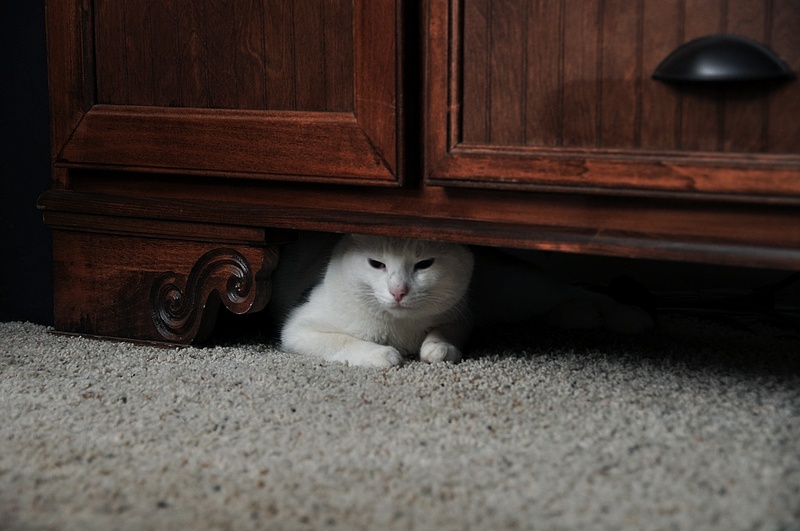 Here’s Homer, hiding under the credenza, where he was chased by Toby, up with whom he will not put. Those puppies are killing me. I’m setting up to get a Dane this summer, but if you were down the road a piece, I’d snag one of those. Poor Homer, Z-man can relate. Jake took a chunk out of his shoulder today after putting up with a week of the Z-man harassing everyone, trying to work his way up the ladder I suppose. His feelings are mighty hurt, as is his pride.